Conversation with friends is key to our well- being. The topics include Holidays, Gardens, Trips out, Sport. Football even has one if its own! 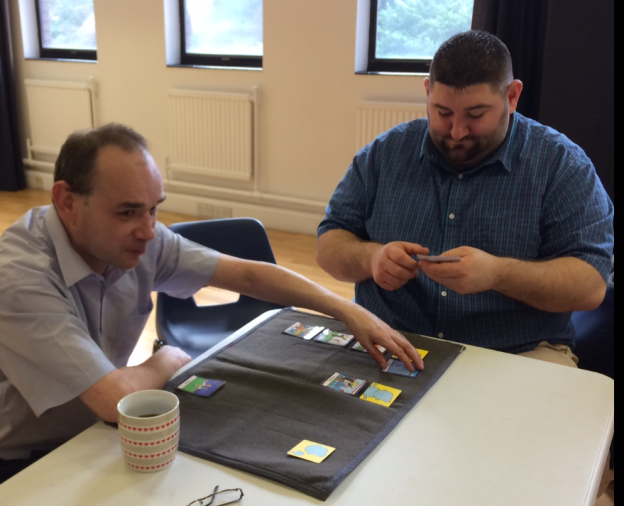 Some of the members of the National Involvement Network in Edinburgh tried out the conversation sets. Fiona’s conversation is generally limited to responding to questions and she has a tendency to agree with what other people say. Using the Holidays topic, she told me that she liked camping and added that she had tried this a long time ago when she was a member of the Girl Guides. I told her I had also been camping with the Girl Guides so immediately this created a bond between us. Sharing experiences can be the start of a friendship. David and James used the Football topic to chat about a recent match they had attended together. Before using the mat to discuss the match they did not know that they had felt differently about the stadium and the crowd. This was a surprise and stimulated further chat. Together they relayed a funny incident that had happened and we all had a good laugh- another aspect of building friendships. David and James have good conversational skills but the Talking Mat took their conversation to a more detailed level. For people who have difficulty getting involved in conversations these topics allow them to share experiences and find links with other people. The Conversation sets are available to buy for people who have attended Talking Mats foundation training. This entry was posted in Blog, Communication difficulties, Learning disability, Mental Health, Participation and tagged Communication difficulties, Mental Health, Participation on March 31, 2017 by Rhona Matthews. A conversation is an informal interaction, between two or more people, in which news and ideas are exchanged. Having a conversation can be an enjoyable activity for people and is an important part of socialisation but is often hard for people with communication difficulties to take part and hard for families, friends and staff to support these informal conversations as well as finding topics to talk about. We have developed a range of Talking Mats symbol sets called Conversation Topics which can be used by people of all ages and abilities to take part in conversations and have a chat. These are now available to anyone who has completed a Talking Mats training course. Each Conversation Set is made up of 3 topics with specially designed symbols. Click on the image to enlarge. Gardens: A resident in a Care Home chatted about what she liked and didn’t like about the Care Home gardens and made some suggestions for changes. Trips Out: A group of people at a Day Centre planned where they wanted to go for their weekly outings. 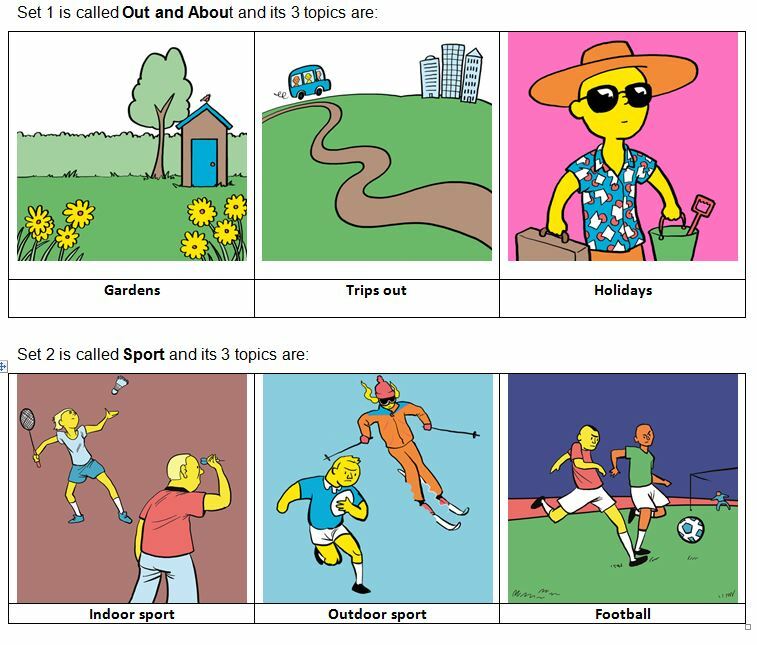 Holidays: A young man with a learning disability talked to his social worker about where he had gone on holiday and what he had enjoyed. Indoor Sports: A woman with a stroke chatted with her friend about the sports she wanted to try at the local Sports Centre. Outdoor Sports: A man with dementia talked about the sports he used to do when he was younger. Football: A group of people with learning disability chatted about what they liked and did not like about a football game they watched on TV. This set provoked lots of lively discussion. Keep a lookout for further sets in the future. 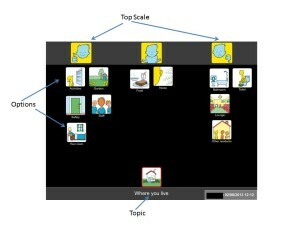 Other resources to expand your use of Talking Mats can be found on our website – www.talkingmats.com. This entry was posted in Blog, Communication difficulties, Participation and tagged Communication difficulties, Participation, Talking Mats on March 17, 2017 by Joan Murphy. I am almost halfway through with my placement at Talking Mats in Stirling. As already mentioned in my last blog, my role involves reading and interpreting stories of Talking Mats to inform investors on their outcomes. Once accurately interpreted, I record the specific elements onto an excel spreadsheet. This allows me to clearly see the positive impact that Talking Mats has upon people, which is an enriching and rewarding personal experience. After collecting the data from the stories, I will interpret the outcomes and design a suitable visual representation such as bar graphs. When collecting the data, I noticed that the layout of the excel sheet could make this analysis problematic. I discussed this issue with my supervisor and we agreed that I could design a more simplified data collection sheet. Designing a more systematic excel sheet has slowed the story collection down but will be beneficial in the long run. In preparation for a meeting my supervisor had with the investor I analysed the data collected from the stories so far. I designed some bar graphs and added brief descriptions of the outcomes, for which I have received positive feedback. I enjoyed taking this initiative and the visual representations of my work clearly illustrate the positive impact of Talking Mats. The bar graphs and descriptions informed my supervisor and colleagues that some categories were too broad and open for accurate interpretation, which in turn has identified issues with data collection. In a meeting, we discussed issues and defined the affected categories to ensure that further data collection will be more accurate. From this meeting I have decided to double check every single story I have analysed far to ensure that the categories and data collected is as precise as possible. The atmosphere at Talking Mats is very lovely and everyone is very kind and supportive if I have any questions. During lunch when we all sit together I get to know everyone a bit better and additionally learn a bit more about their projects. This week I will have my mid-review meeting with my supervisor, which I look forward too. The experience of working at Talking Mats has enhanced many of my skills. Firstly, I was afraid of working on such an important project independently, however it turns out that I really enjoy working on something on my own, which has increased my independence and confidence in taking on responsibilities. Moreover, I have learned not to be afraid to ask for help if I do not understand something or if I am not a hundred percent sure about something, which is important. I have analysed data throughout my undergraduate degree, which has been very useful for this project. Ultimately, this experience further improves my excel and visual presentation skills. I look forward to continuing with the story project and I am eager to help with the analysis and I cannot wait to see the final report. P.S. Celine’s supervision meeting went very well!! Watch out for her next post. This entry was posted in Blog on March 3, 2017 by Joan Murphy.